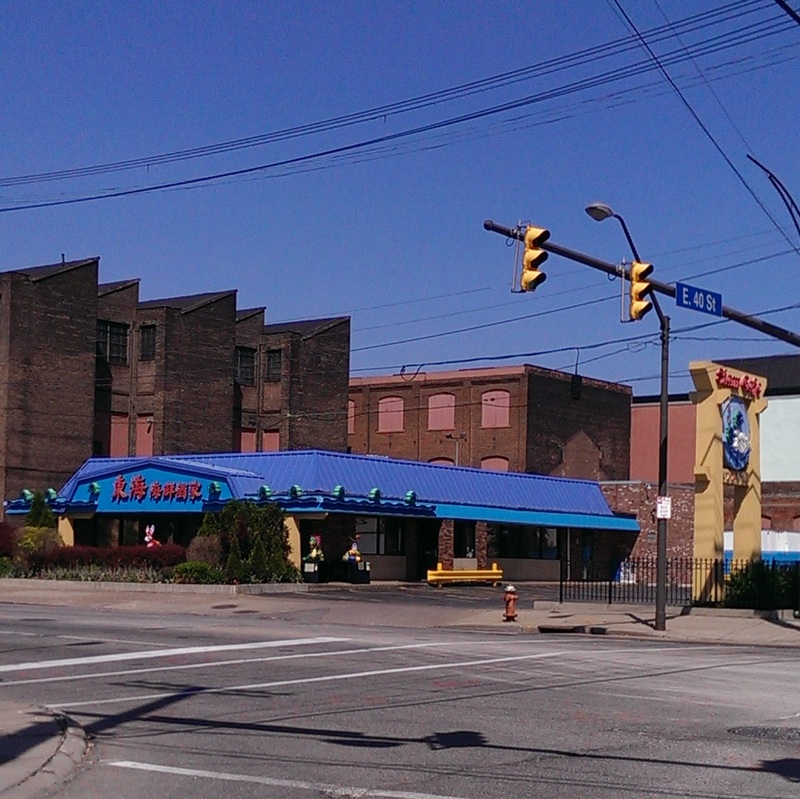 Siam Cafe, located at the corner of E. 40th and St. Clair in Cleveland’s Asia Town district, is a favorite of Asian and non-Asians alike. My foodie friends have talked about it so much that I finally decided I needed to check it out. Several of them have MSG sensitivities and enjoy eating here because they don’t have any side effects afterwards. It is housed in what looks like a converted fast food restaurant, but I think that makes it unique and charming. I particularly love the “Year of the…” sculptures around the restaurant. The extensive menu features Thai, Vietnamese and Chinese dishes under the headings of soup, lobster and crab, seafood, poultry, fish, frog, beef and pork, vegetable and bean curd, casserole, rice and noodle soup. Lots and lots of choices and lots of exotic choices such as jelly fish or eel as well. They have tanks of fish, lobster and frogs that they immediately use in the kitchen. Be sure to ask for the regular menu. They gave me a very limited Americanized menu the first time I went there. You can view an online menu here. One of my favorite things about this place is that it is open until midnight, which is good to know when you leave an Orchestra performance or movie at the Cinematheque and are hungry when the restaurants in Little Italy have all boarded up for the night. It is open 7 days a week from 11 a.m. to midnight. They have eight different flavors of bubble tea (including mango, melon, coffee, and coconut), Thai iced tea, iced drip coffee with condensed milk, ginger tea, ginseng tea, fruit juices and soft drinks. If given the choice I will usually order a Thai iced tea, with the iced drip coffee as my second choice. A proper Thai iced tea is a thing of beauty – a deep orange tea with spices and a layer of creamy coconut or condensed milk. In Thailand, condensed milk and sugar are mixed with the tea before it is poured over ice and then topped with evaporated milk. Their version of Thai iced tea does not have layers, but it is still delicious and refreshing. I started my meal off with an order of the Siam Wings, which are marinated boneless chicken wings stuffed with a “house filling” and and then deep fried. They are known for their wings. The house filling is apparently dumpling innards (a savory mix of pork, veggies and vermicelli). Dipped in a sweet/sour and slightly spicy sauce the wings were a great start and were probably the most unique preparing of wings I have ever eaten. I ate two and took one home. They also have both summer rolls and spring rolls on the menu. I ordered the crispy spring rolls and got to try a half of the summer roll. Spring rolls have a thinner wrapper than a basic egg roll. 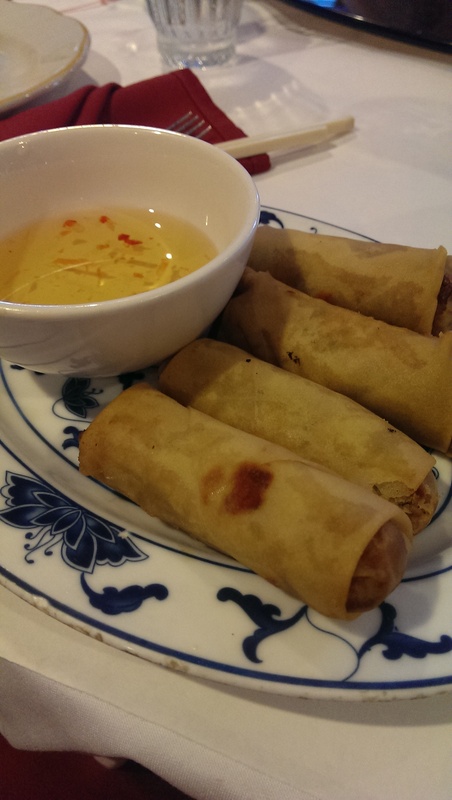 Their spring rolls were very nicely fried, and the chicken and vegetable filling was quite delicious. The summer rolls are made with rice paper wrapper and filled with lettuce, shrimp, vermicelli and other fresh fillings. I enjoy making them at home, and this was a good version. The peanut dipping sauce was also really nice. They also serve veggie spring rolls if you are a vegetarian. I ordered the Pla Red Pik based on an Urbanspoon review. I was in the mood for fish and Stuart Spivack’s photo on Flickr made it look good. Stuart is an Asian food expert, so I know I can trust his judgment. He has amassed a huge collection of photos of Siam Cafe’s food over the years. The Pla Red Pik is listed as a chef specialty and features three generous, very lightly breaded fish filets (I had asked for perch) in a tamarind-pepper sauce. Just a very mild amount of heat from some hot pepper slices. Not too overwhelming for this Americanized palate. I enjoyed it very much. As for dessert, I see they have green tea ice cream as well as some other flavored ice creams, but was surprised to see they serve Black Forest Cake. That is a German dish and not the easiest one to make well. It just seems like an odd offering at an Asian restaurant. I celebrated my birthday here with friends this year and was served a piece with a candle. It wasn’t bad, but it was a little drier than I like. We all shared it. 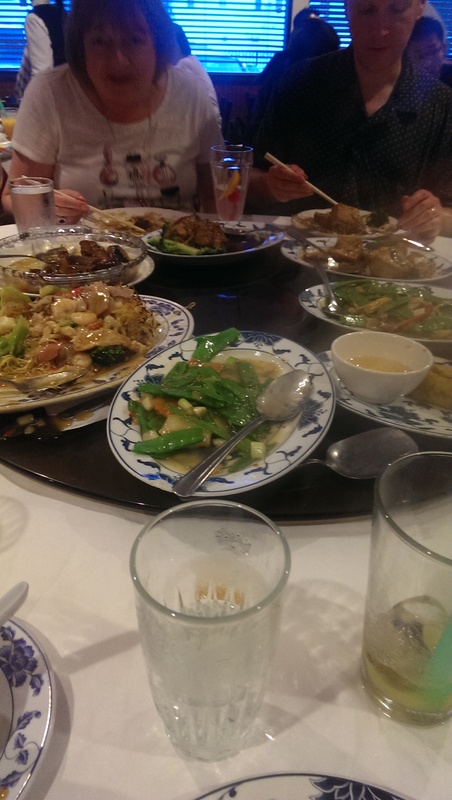 We had a large group for my birthday and ordered a mess of food and passed it all around. My particular favorites were the scallops and pea pods. It was delicious. 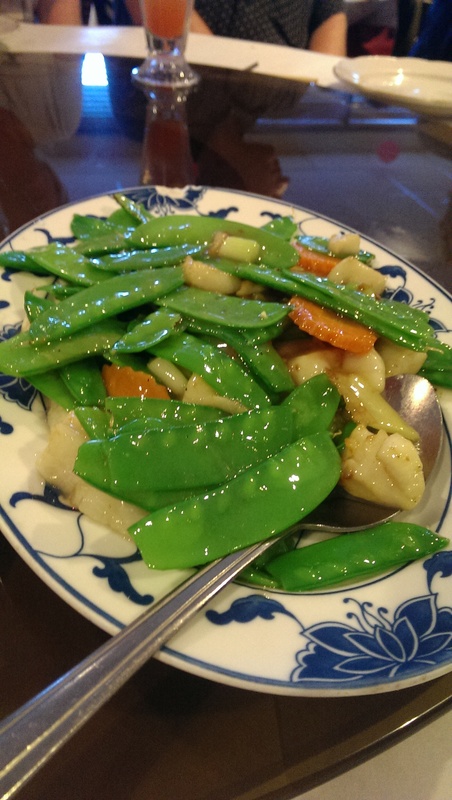 It is in a very light, clear sauce that literally made the pea pods glisten. The scallops were perfectly cooked and paired well with the pea pods. And they were generous with both ingredients. I thoroughly enjoyed the scallops and pea pod leftovers the next day. 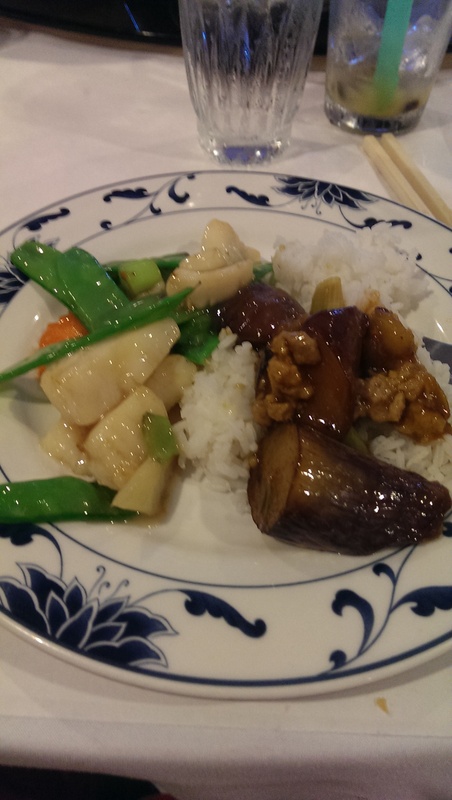 The eggplant with minced pork was also a favorite, and the version without the pork was also quite good. The eggplant they use is small Asian eggplant. The sauce is a delicious brown sauce. It is on the right of the plate along with some scallops and pea pods. 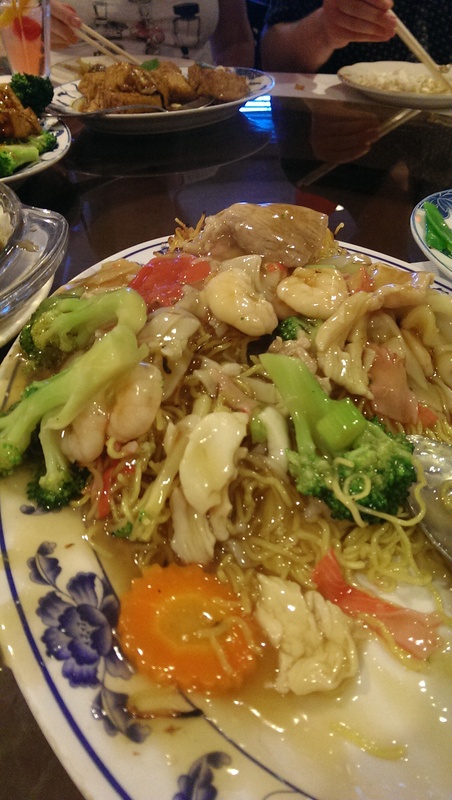 The pan-fried noodles with meat and seafood was a HUGE portion. The noodles seem to be some sort of ramen noodle. They were crispy on the edges and deliciously soft where it soaked up the sauce. It also had lots of fresh vegetables. As you can see on the right, we barely made a dent in it. Several of my vegetarian friends were rather disappointed with the Siam Cafe. They were completely taken aback to see that most of the entrees listed as vegetarian featured minced pork (a most decidedly non-vegetarian item). 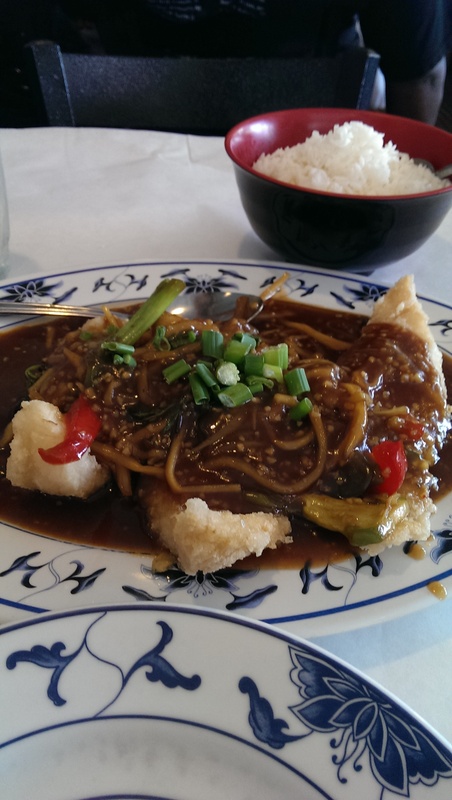 They had no problem leaving the minced pork out of one of our orders of spicy eggplant. My friends also did not like the consistency of the tofu dishes. The tofu was a bit spongier than they like. Then again, they have been spoiled by Pura Vida’s tofu and now hold all other tofu up to that standard. It’s a hard standard to meet. In any event, this was a great place to celebrate my birthday on a Friday night. We took up two large round tables (there were 15 of us), and the service could not have been more accommodating. They had no problems with separate checks and took care of every request. I can’t wait to go back and try some other things, like the baked shrimp in shell with spicy salt or the razor clams in black bean sauce. With such an extensive menu I imagine it will take me a while to work through it.